Mice in the wild spend much of their time burrowing tunnels to locate food sources and building small caves for comfort. Nocturnal creatures, they prefer dark, confined spaces to open ones, where they might be vulnerable to predators. Domestic mice have the same instincts and are happiest when they can act on these inborn drives. Give your pet mice plenty of room to do what comes naturally. Be sure your cage has at least 15 square inches of floor space and 5 inches of headroom to ensure your mouse has enough space to burrow and build. If you have multiple mice or are planning to breed your mice, a larger amount of space is preferable. For territorial mice, you may need to provide a much larger enclosure, more nesting materials and more than one feeding and watering location. Keep your pet mice safe from other house pets by placing the cage on a tall table or dresser. Fill your mouse cage with at least one inch of dust-free, non-toxic bedding. Pelleted or shredded paper or tissue and non-dyed cotton make excellent nesting material for mice. Avoid wood shavings, dyed fabrics or scented commercial products, as they can be irritating or even toxic to your pets. Remove moldy, soiled or wet bedding every day or two, and replenish the mouse cage with clean materials frequently. Discard old bits of food or soiled items, and sanitize the habitat at least once a week using a non-toxic disinfectant and hot water. Give your mice empty cardboard paper towel or toilet paper tubes to provide them extra burrowing opportunities. Unbleached cardboard tubes can serve as perfect burrowing tunnels in small cage. 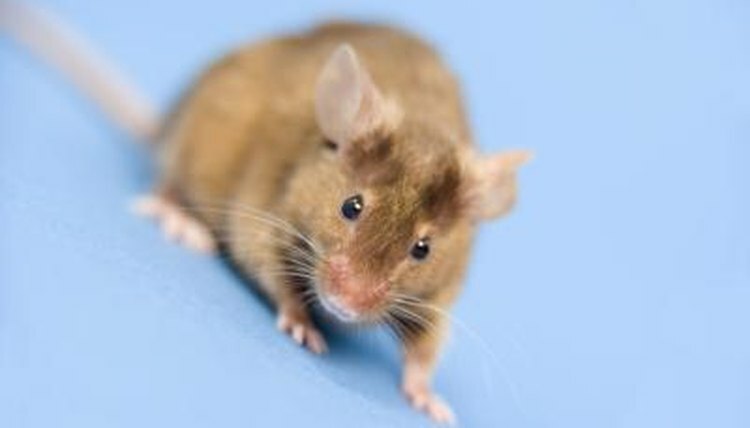 Avoid PVC tubing, as it contains toxic chemicals that your mice may chew and ingest. Mice in the wild spend much of their time burrowing tunnels to locate food sources and building small caves for comfort.